THE INTRO: We believe the questions individuals ask have tremendous power, and when teachers or students start asking questions, we really take note! Questions help us frame puzzling thoughts. Well-framed, thoughtful questions demonstrate our attentiveness to the subject at hand. Questions help us clarify conceptual understandings needed to apply procedures, to make sound decisions about implementing processes, to analyze more deeply, to evaluate more thoroughly, and move us on to creating more expressively. Essentially, questions can help us progress across a continuum of thinking taxonomies like Bloom’s. Questioning is truly an art. Asking the right questions takes skill and practice. Think of all of the professionals for whom questioning is an essential component of their work–investigators, reporters, policemen, doctors, lawyers, and, of course, teachers. We ask questions not only to solve problems but also to start conversations and keep them going, to deepen our understanding, and to generate new ideas. We would like to share a set of questions that was recently posed to us. THE CONTEXT: The questions were generated by a team of teachers who, through self-assessment, indicated that they usually differentiate instruction the same way because they lack clear, concrete strategies to provide the kind of variety that appeals to diverse learners. Because we differentiated the professional learning activities for this session based on their readiness among other things, this tiered task focused on generating a questionnaire posing questions they wanted answered about how to differentiate instruction effectively. Their questions as presented above are, for your convenience, also outlined below. You will notice they titled their questions How?, indicating they were mainly concerned about applying procedures and implementing processes to differentiate effectively. 1. 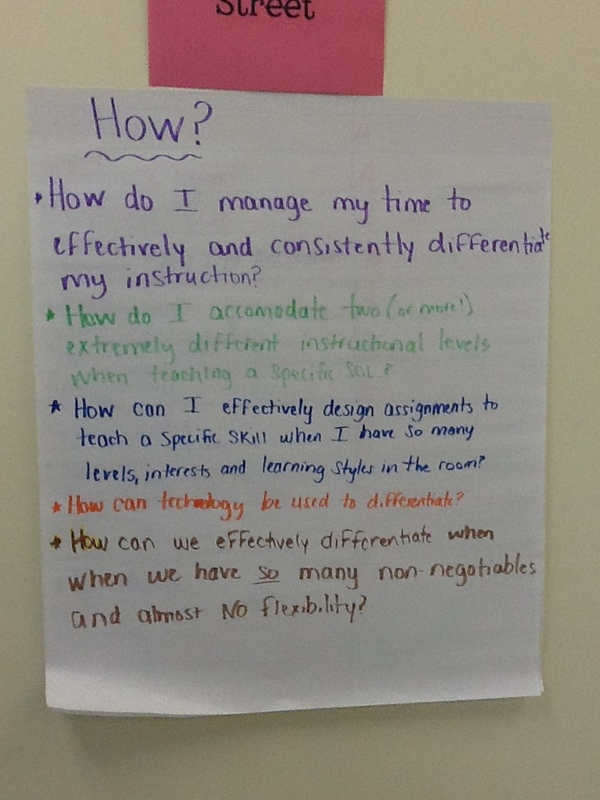 How do I manage my time to effectively and consistently differentiate instruction? 2. How do I accommodate two (or more) extremely different instructional levels when teaching a specific SOL (Standard of Learning)? 3. How can I effectively design assignments to teach a specific skill when I have so many levels, interests, and learning styles in the room? 4. How can technology be used to differentiate? 5. How do we effectively differentiate when we have so many non-negotiables and almost no flexibility? THE POWER: The power of these questions rests in the fact that generating them forced teachers to identify specifically what it was about differentiation that posed a problem for implementation. This identification process sparked a lively discussion and thoughtful considerations about which concerns were truly worthy of ink. Their questions also outlined the direction of the session’s next learning steps. Revisiting these questions regularly during the course of the session served as a dual means of formative assessment. Using these questions to frame our instruction permitted us–eduConsulting Firm–to (a) determine the extent to which we were meeting the identified needs of our learners, and (b) assess how well participants were able to assimilate the instructional practice into their professional needs. THE DISCLAIMER: We don’t claim to be able to answer every question posed to us, and in this case, we didn’t. Realistically, not only is it impossible to do but also proves to be counterproductive to our belief that learning is a facilitated self-discovery and guided acquisition of knowledge. 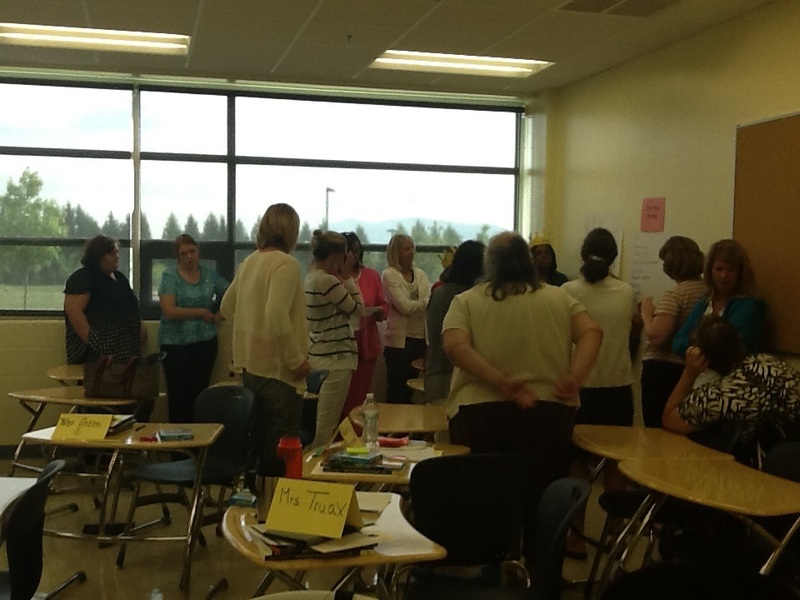 THE IMPACT: Through active engagement and by seeing a variety of differentiated instructional strategies modeled and applied, teachers came to their own conclusions about how to answer 4 out of 5 of their own questions. The last question–the brown question, as they called it–which related to non-negotiables and inflexibility was addressed but not answered. Fortunately, we will have an opportunity to see for ourselves exactly what barriers teachers are alluding to as we take part in their school processes this year. Hopefully, we will help them discover successful ways to navigate these perceived difficulties as we provide implementation support. Got questions? Visit our website below!